When Holland America Line announced the building of this new class, it was intended to built six ships. The class was already referred as the Vista-class and this caused a problem, because the ships would be called after the points on the compass: Zuiderdam, Oosterdam, Westerdam, Noordam and ehh... Because parent company Carnival Corporation is very good in transferring ships between her daughters, this problem was eventually solved when Holland America recieved four ships, Cunard Line one and the last one was cancelled (first, later to be added again in another shape). These ships would be the biggest ships ever built for the old Dutch company, surpassing the 60.000 GRT Rotterdam-class by 20.000 tons. What makes the Vista's directly recognizable is an unusual feauture of modern ships and that's two working funnels. This was last seen on the transatlantic Italia-liners Michelangelo and Raffaello in the mid 60's. Also, the glass elevators on the outside are innovative, though not brandnew. We've seen them a little bit earlier on Celebrity's Millennium-class. What you hear among Dutch people is that they do not like the looks of modern ships, especially the HAL-ones, but the Vista-class looks are pretty good. 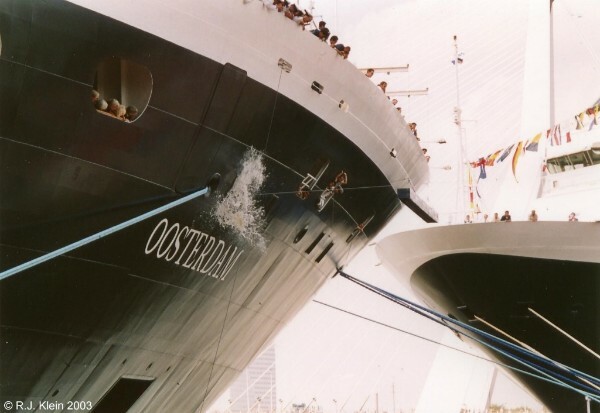 Of course it helpes that the second Vistaship Oosterdam was named in Rotterdam, spectated by thousands of people along the riverbanks and the Erasmusbridge. 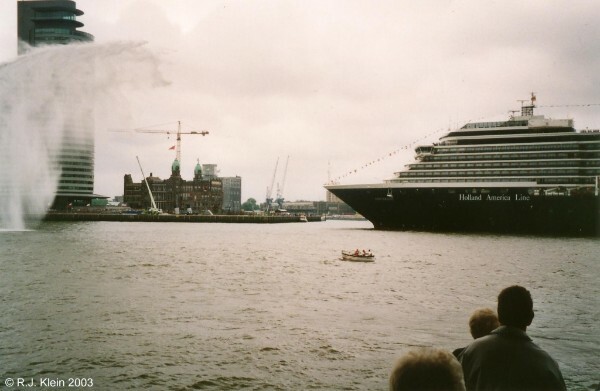 The first Vista-ship was the Zuiderdam of 2001, named 'Zuiderman' due to little mistake by her godmother. The ship measures 82.305 tonnes and started sailing the Caribbean. She was followed by Oosterdam in 2003, with 81.769 tonnes somewhat smaller in size then her older sister. This ship was named in Rotterdam on the 29th of july, where she was joined for the occation by her fleetmate and flagship Rotterdam. 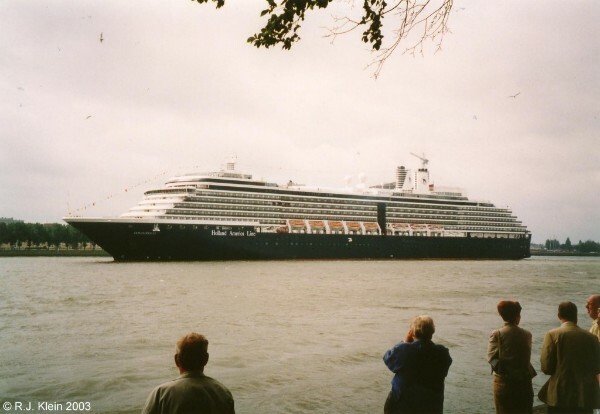 It was the first time since 1958 that a Holland America ship was named in the Dutch port and it was also the first time in decades that two HAL-ships were berthed together in the big city. Her godmother is Princess Margriet of The Netherlands. Oosterdam is 290 meters long, 32,25 meters wide and her draft is 7,9 meters. She was built at the Fincnatieri wharf at Marghera, Italy, as yardnumber 6076. Her 11 passengerdecks accomodate 1848 passengers and 812 crew and her maximum speed is 24 knots, although she normally sails at 22 knots. She is propelled by two ABB Azipods, powered by five Sulzer diesel electric engines and one gas generator. 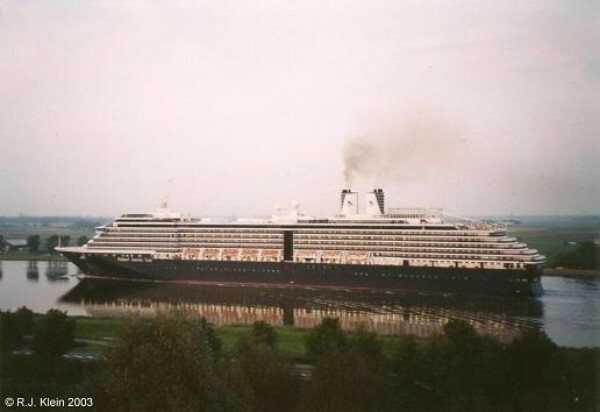 There has never been an Oosterdam before in the Holland America Line history, the only point of the compass that was never awarded a shipname for them before the Vista class came into being. There has been an Oosterdijk, though. In HAL history, passengerships names ended at 'dam' and freighters ended their names at 'dijk' (or the more international 'dyk').